The National Nut Day is celebrated every year on October 22. It is a well-established food holiday in the United States, and lately it has been promoted in the UK as well. It honors the health benefits of nuts. The term “nut” can be interpreted in different ways. 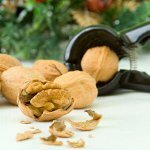 In a botanical sense, a nut is a fruit composed of a seed and a hard indehiscent shell (i.e. the shell that doesn't open to release the seed). Hazelnuts, chestnuts, and acorns are true nuts. However, the common usage of this term is less restrictive. Many fruit composed of a hard shell and edible kernel are referred to as “culinary nuts”. Some fruits and seeds that are not nuts in a botanical sense but are considered nuts in the culinary sense are: almonds, Brazil nut, candlenut, cashew, Chilean hazelnut, macadamia, malabar chestnut, pecan, mongongo, peanut, pine nut, pistachio, walnut, Yeheb nut. Most nuts are high in nutrients therefore they are widely used in vegetarian cuisine. Nuts are usually rich in fat, protein, vitamins, fiber, and essential amino acids. Due to their high energy density, they can be consumed as a healthy snack. Many nuts are most healthy in their raw form. However, cashews are not eaten raw because of their toxic shell, they must be steamed or roasted. To celebrate the National Nut Day, substitute nuts for your usual snacks. Nuts are tasty, healthy and nutritionally beneficial.